Location: The „Aquatonik” hotel is situated in Velingrad, which is said to be the spa capital city of the Balkans. Not incidentally, the town is called “The Pearl of the Bulgarian balneology”. According to the legend, Orpheus once lived in these lands and Spartacus got his titanic power here… The history remembers a lot about the region of Chepino. 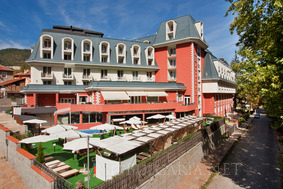 Velingrad is the most visited Bulgarian balneology resort. It is unique for the incredible combination of favorable climate and landscape factors. Velingrad is situated in Southwest Bulgaria, only 130 km away from our capital Sofia and 80 km from the second largest city in the country - Plovdiv. The „Aquatonik” complex stands on about 4, 5 decares and is built on the bank of the Kleptuza Lake, which is fed by the biggest carst spring on the Balkans. Spa And Wellness: “Aquatonik” complex offers massages, ancient spa rituals, Ayurveda therapy, slimming programs as well as skin, face and body care procedures, hydro massage and tangentor or aroma baths of your choice. Sports & recreation: Fitness, tennis court, hall for games and of course a protein bar – everything that could refresh your body and make your day more fascinating. Relax room: Since ancient times the Japanese consider places surrounded by natural cliffs, trees and flowing water for homes of the gods. This, precisely, is the Japanese Tea House in the complex – a place that recreates the nature. Only here you have the opportunity to enjoy a cup of tea while observing the whole universe.